This is luxuriously smooth and warming pie, full of the tastes of the sea, and ideal for a winter evening supper. Always use the freshest and best quality fish you can buy; we source our fish from our local supplier GVS Quality Fishmongers whose retail vans can be found in a variety of locations around South Yorkshire - check their web site for one near you. Serves 4 hungry people! You will need a pie dish approximately 18x25x50cm. First boil your eggs in a small pan, covered by 2cm of water for 7-8 minutes. Drain them and place them in cold water to cool. If you use eggs about 5 days old it makes them easier to peel. Peel and chop the potatoes, and cook them in a large saucepan of salted water, until they are soft and mashable. Drain and mash with the crème fraiche. Set aside, and cover to keep warm. In a medium sized saucepan, heat the 400ml milk, bay leaf, mace, and peppercorns. Bring to a boil and remove from the heat. Leave for 20 minutes to infuse the flavours. When cool strain the milk into jug. Whilst the sauce milk is infusing, poach the fish in covered sauté pan, using the 200ml milk. Bring the milk slowly to a simmer, then simmer gently for about 7-8 minutes until the fish is just starting to flake. Remove the fish from the milk and set aside on a plate to cool. Strain the poaching milk and add this to the sauce milk. In a medium sized saucepan melt the butter over a medium heat. Once melted stir in the flour. Stir thoroughly and a thick paste will form but don't worry. Cook gently for a further 2 - 3 minutes. Gradually stir in the milk. I prefer to use a whisk as I find it easier but a wooden spoon is fine. Bring to the boil, lower the heat to a simmer. Simmer for 5 minutes, stirring frequently to make sure there are no lumps. The sauce should be quite thick but still a pouring consistency, if too thick add a little more milk. Add a good pinch of sea salt and a few grinds of black pepper to your taste. Keep the sauce warm until needed. If you need to keep the sauce longer than about 15 minutes lay a piece of buttered greaseproof paper on the surface to prevent a skin forming. If a slight skin does form, whisk thoroughly and it should disappear. Now gently flake the fish, removing any skin, and bones that you may find. Carefully mix the fish together to get an even mix and add to the pie dish in an even layer. Now add layer of cooked prawns over the fish, and pour the sauce over the fish and prawns. Carefully use a spoon to make sure the sauce is evenly spread through the fish, and just level with the top of the fish, but not covering the fish. You may have some left over sauce which you can serve on the side. Now peel and slice the hard boiled eggs, and spread these in a single layer over the fish and sauce. 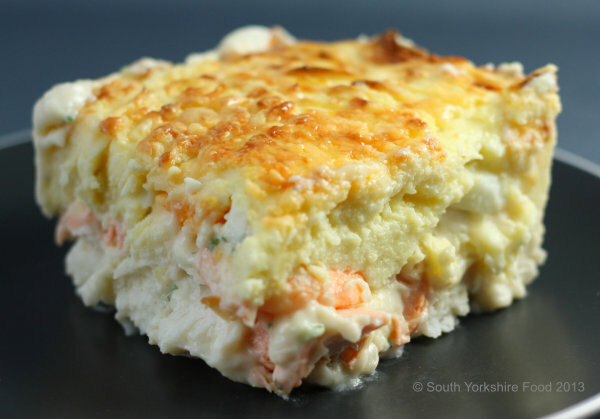 Using a stiff spatula, spread the mashed potato over the layers of egg, prawns and fish. The potato spreads most easily if it is still warm. Make sure the cover is even and that there are no gaps. Use a fork to make decorative lines on the top of the mash and sprinkle the grated cheese over the top. Heat the oven to 375°F / 190°C /Fan 170 °C . Put the pie dish on a baking sheet, and bake for 25-30 minutes until the top is golden and the pie is starting to bubble at the edges. Serve with fresh peas or steamed broccoli, and any leftover sauce on the side.